This week the Target Holiday Gift catalog came in the mail. You know what that means…the kids started taking turns with pens and post-its to mark their “wishes” in the catalog. I told them, “dream on”! It reminds me of the years in my childhood when my grandmother would pull out the Sears Catalog and would ask us to create our wish lists to offer her. As adults, in our family, we tend to keep running lists of wishes, in the event that someone asks! I am a kitchen tool junkie. I love them. I have drawers and cabinets full of them. 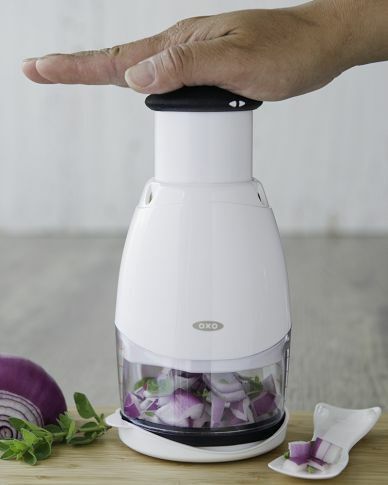 My list of wishes most always includes a new kitchen tool. My mom, sister and I often give each other new kitchen gadgets for Christmas. 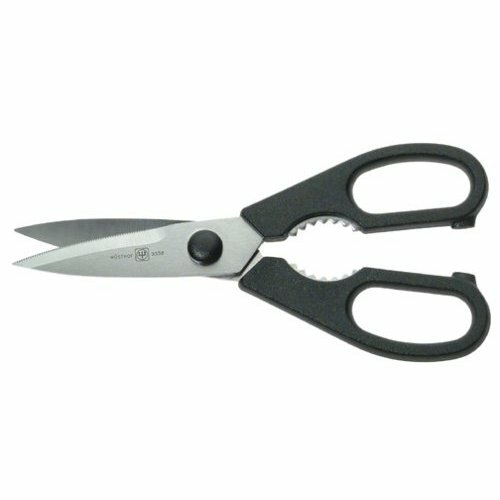 Some of my tools are used daily, like my kitchen scissors and my 4 Tbsp. measuring cup; while others I use only once in a while. 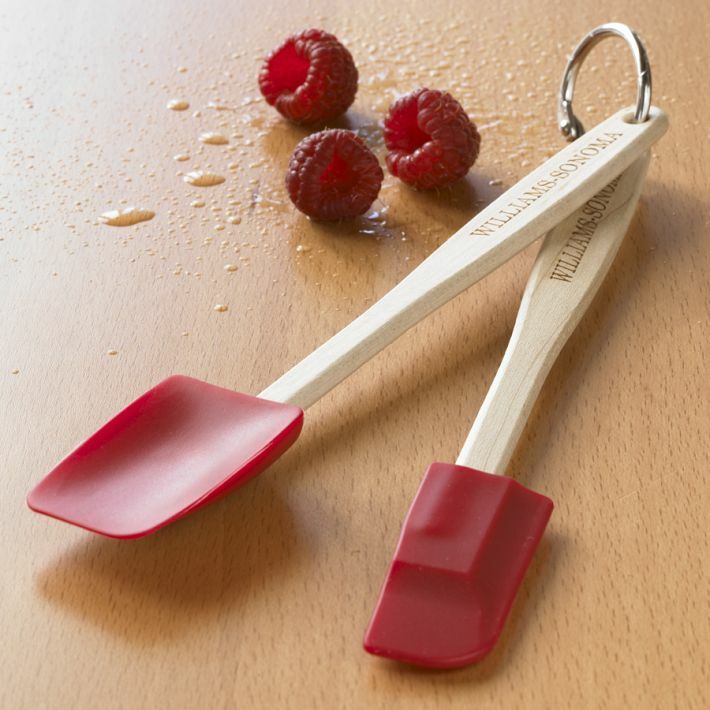 But when I need it, it is extremely useful…like my cherry pitter. About a year ago a friend asked me for recommendations of kitchen tools that she might collect to better equip her kitchen. What a fun task it was to make a wish list for her. 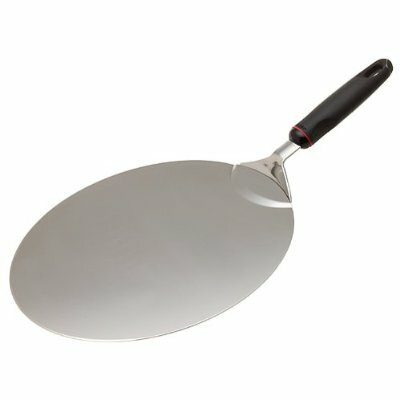 I thought I would share with you, a further expanded list of some of my favorite kitchen tools. Just in case anyone asks! I have divided them into categories by cost, and of course, this is not an exhaustive list, but rather one that includes some of my favorites! Cherry Pitter – Check out my story about this gadget. 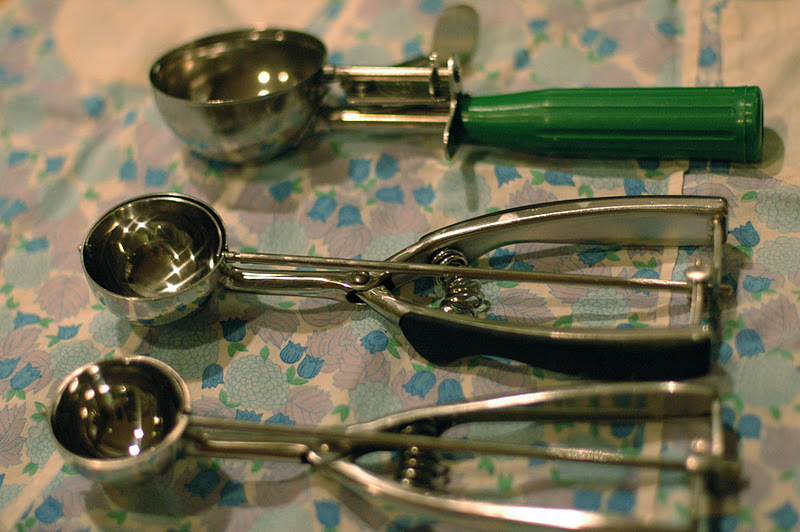 Scoops – We use scoops all the time when baking cookies and muffins. There are several sizes which are all useful. 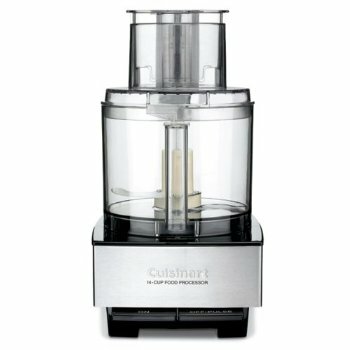 It decreases the mess and creates more consistent-sized baked goods. 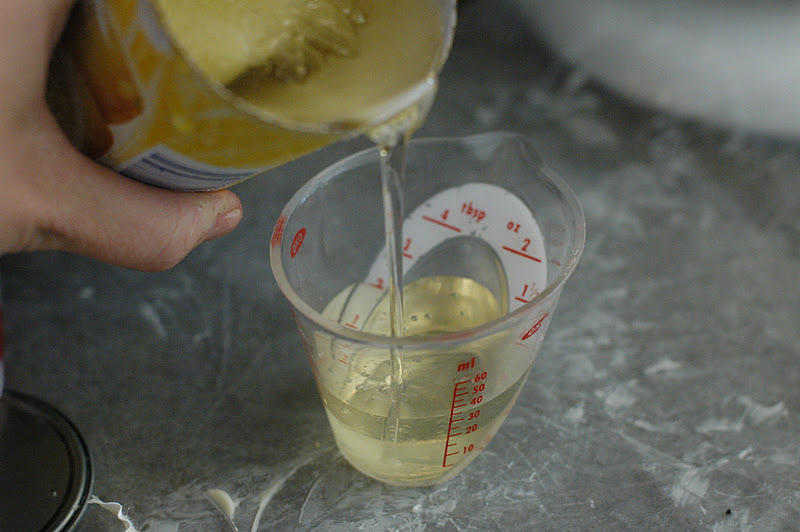 Coconut oil… any solid, gooey substance. get under your burger to flip it. cooling rack to the serving dish. It can also lift a Pizza right off the pan. Everyday Food magazine (by Martha Stewart)- It is so practical, user-friendly and a great way to inspire new recipes in your kitchen. I’ve had a subscription for years and some of the “staples” in our kitchen have come from it. I have given it as a gift a few times too. It’s only $12 and it’s the gift that keeps on giving. 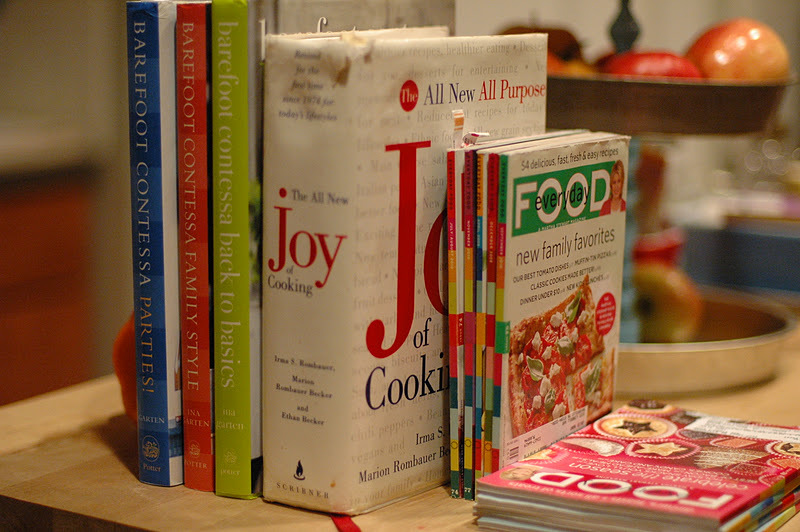 Barefoot Contessa cookbooks– You can’t go wrong with these beauties. There are several to choose from and I love all the ones I have. There are beautiful photos of each recipe and great tips. She is a fabulous teacher through her cookbooks. The Joy of Cooking cookbook– If I were to recommend ONE cookbook for your kitchen, this would be the one! It’s my favorite Primer. I call it my kitchen encyclopedia. It has so much information including: varieties of lettuce, to cuts of beef, to temperatures for doneness of meat, to “what is salad nicoise?”, to how to make a good graham cracker crust, and 1,000 plus pages of other instructions! Travel knife– I found these at the check-out at Williams Sonoma (in those glass jars by the register) and thought they were cute. When I got to looking at them, I realized they are more than cute, they are really useful. 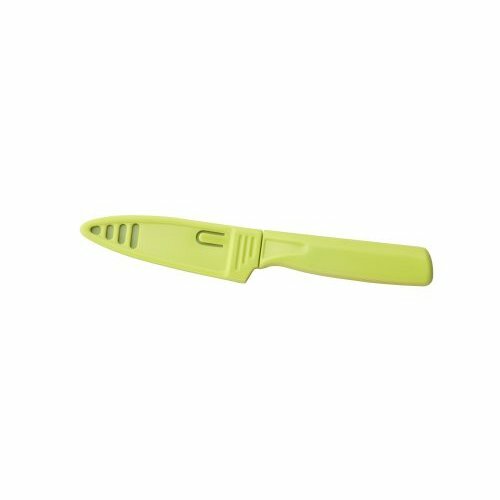 The knife has a good, sharp blade, but with a sturdy plastic cover. I bought a couple, one to keep, another to gift, and I have ended up keeping mine at my desk at school to use for lunchtime to slice my apple. I then bring it home for the summer, to put with our picnic gear for our meals at the pool and park. 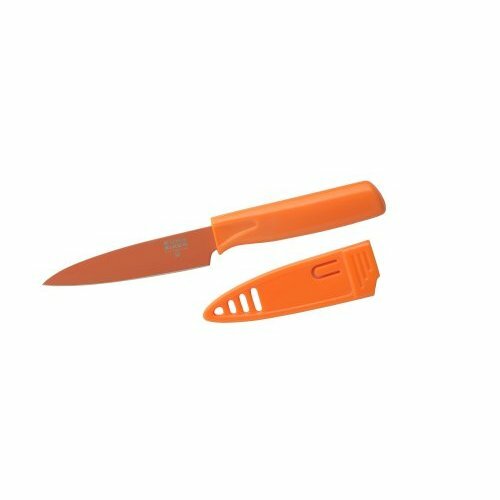 It’s a great knife and safe and easy to tote. 4 Tbsp measuring cup– it’s adorable and so useful! Do you ever try to measure Tablespoons of vanilla or oil and end up pouring it everywhere when it overflows the measuring spoon? No longer does this happen with this! 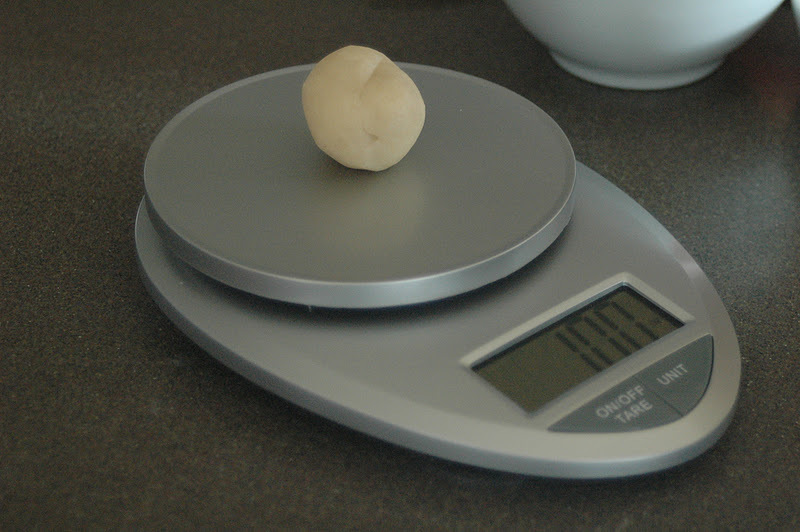 And the curved design makes it so easy to properly see the measurement. My mom found it and gave one to my sister and me. I have since gifted it to a couple of people because I think it is so useful! 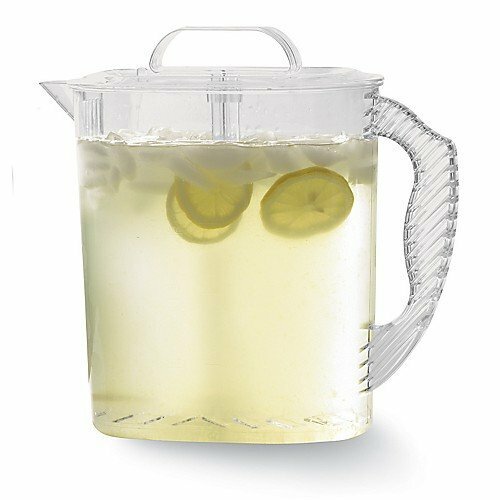 Pampered chef pitcher with plunger– This is great for serving lemonade and fruit tea, especially because the plunger allows you to “stir it up” before each serving. Before I had this, I served my fruit tea with a large, awkward wooden spoon in the pitcher. Though it is plastic, the design is classy enough to serve at a party and not look tacky. 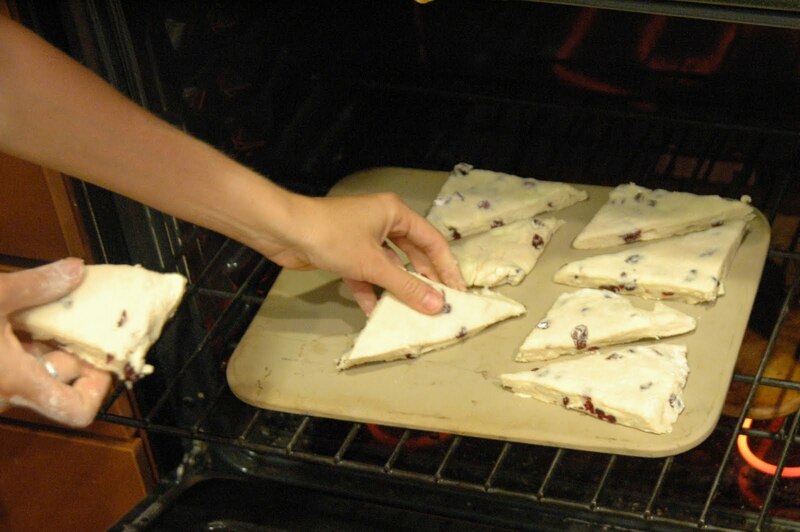 Baking stone– I had a pampered chef baking stone in my cabinet for years, un-used, until a friend in my Bible study asked if I had a stone on which we could bake her cranberry crescent rolls. I pulled it out and we put 1/2 of them on it and 1/2 on a cookie sheet. The difference in the baking consistency was remarkable. The rolls cooked on the stone much more evenly and without being overdone on the bottom. It made me a fan. I now use it especially when I am baking scones, shortbread and biscuits. Cutco knives– These knives are my VERY FAVORITE. They are expensive, but so worth it. They have a lifetime guarantee and they make food prep much easier. 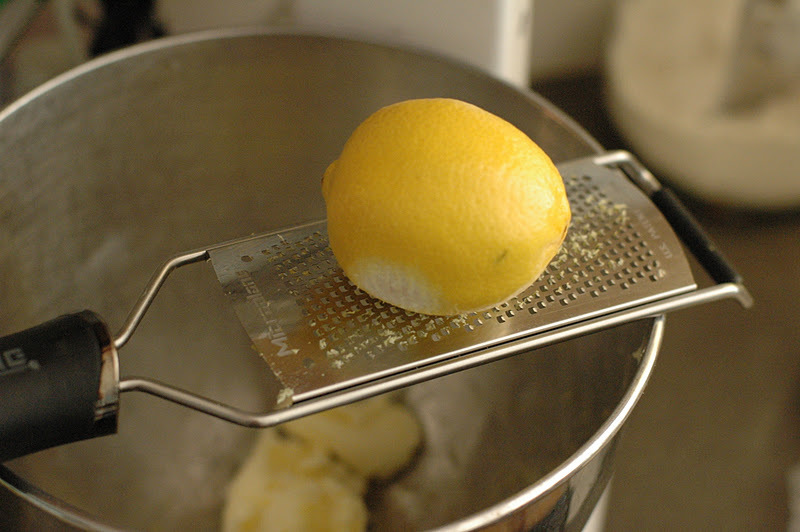 Do you ever find cutting an apple or slicing a cucumber difficult? It’s because of the knife you are using. My mom converted us years ago and any time I am able to buy one for someone, I do so. If you only have one, I would purchase the trimmer. 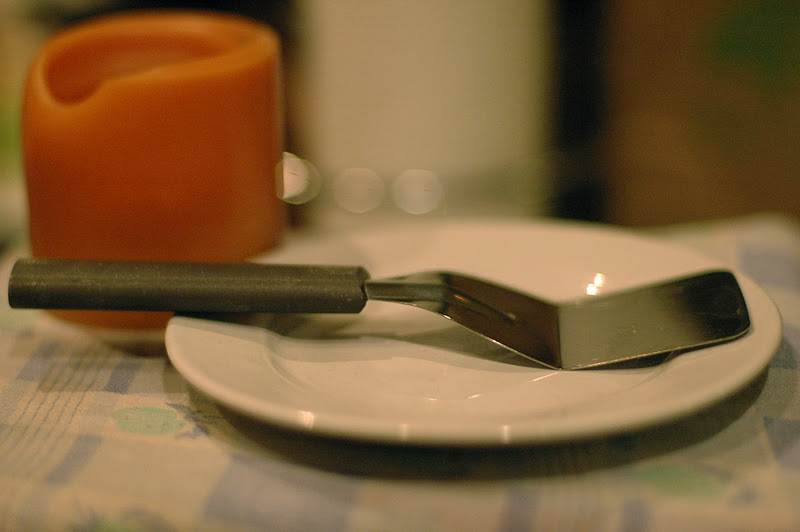 Everyone I know that has one, says that it is in constant use in their kitchen. Waring double waffle iron -Read Here for the story behind this waffle maker. 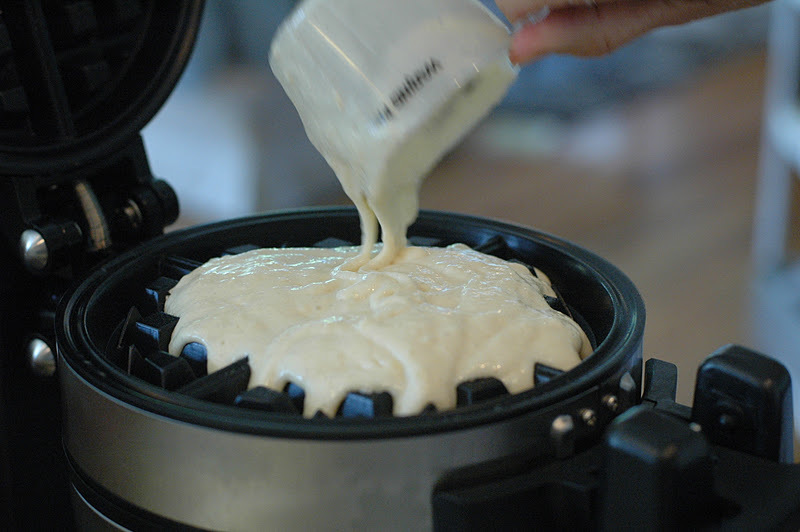 Basically, if you love a deep-grooved belgium waffle and you like to make a bunch quickly, this appliance should be added to your list. It is cool! You will feel like you are at a Hilton hotel breakfast bar. 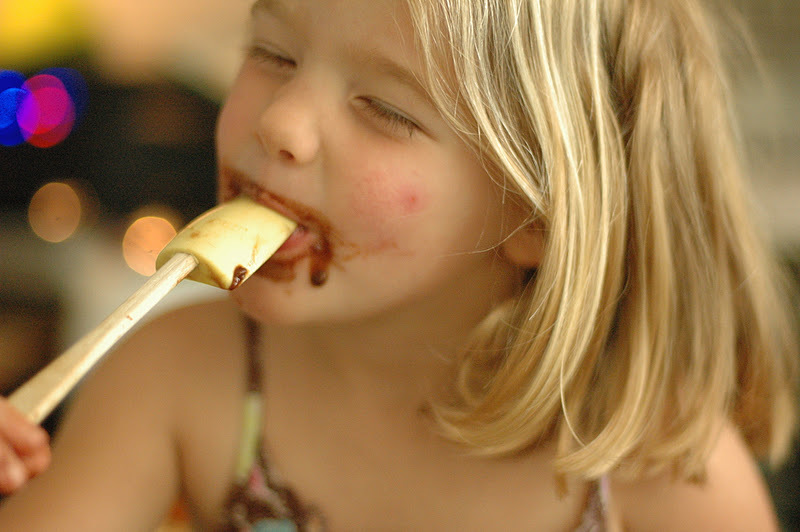 (And use the Oh Boy Waffle Recipe that won our taste test). 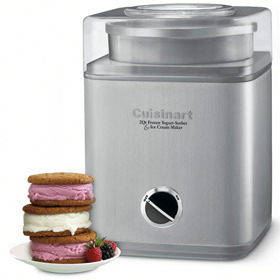 Ice Cream Maker – This is our newest appliance. I have long loved making homemade ice cream but this is our first indoors-without-rock-salt-and-ice maker. 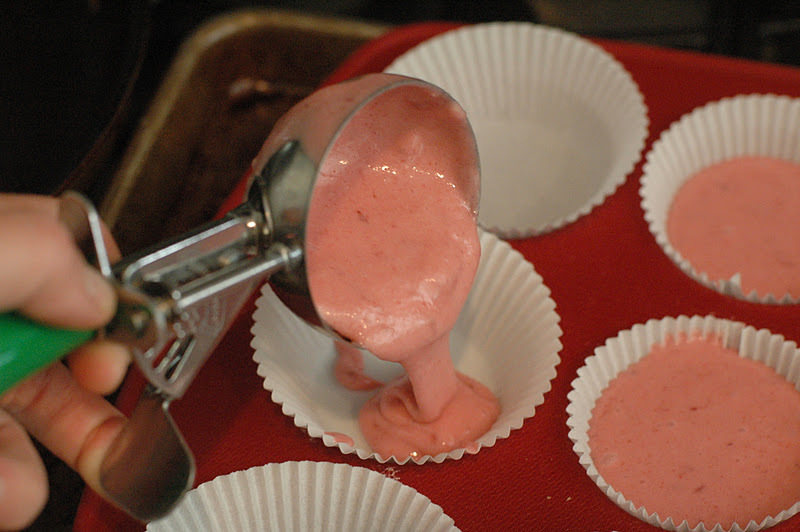 It is a nice 2 quart size, so you can experiment with different creative flavors without investing in a giant batch. It is easy, fast and we have been making some tasty treats in this beauty! 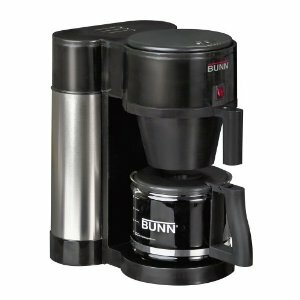 Bunn Coffee Maker – I will be posting soon about making a good cup of coffee, and I must say, when it comes to a cup of brewed drip coffee, nothing compares with a BUNN. The technology is fascinating. There is a reservoir of hot water stored in the tank behind the pot. When you pour water into the coffee maker, DISPLACEMENT occurs as the new cool water pushes out the hot and it SPRAYS over the coffee grounds to produce immediate, hot, fresh, delicious coffee. When our friend Amy lived with us, and our coffee pot died, she encouraged us to buy a BUNN and we have been fans ever since. We gave one to my dad a few years ago and he’s become a fan too (as much as he would claim be a “fan” of any inanimate object). 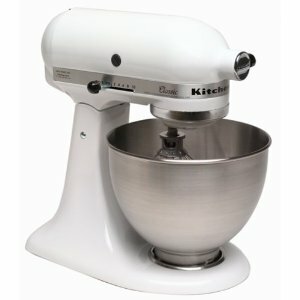 Kitchen Aid Mixer – Many of you have a Kitchen Aid Stand Mixer in your kitchen and you might be able to vouch for the fact that it is a tremendous asset in the kitchen. It is costly, but it is a work-horse. I love mine. It has served me well. There are several varieties of them and they each come with accessories. I love the dough hook as well as the flat beater. 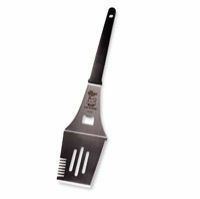 It is stately and beautiful and used at least once a week in my kitchen! Food Processor– this is worth having, if only to make THIS homemade salsa recipe! It is so great. 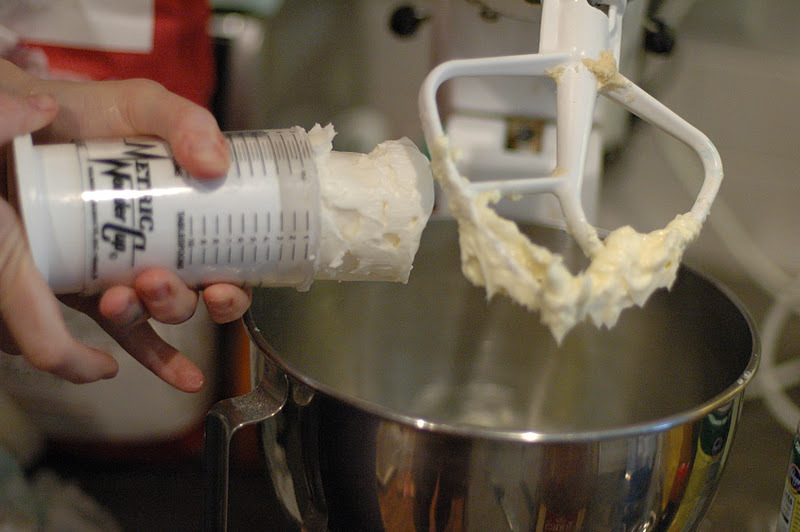 I don’t use it as much as I use my stand mixer, but I use it often enough to justify owning it. 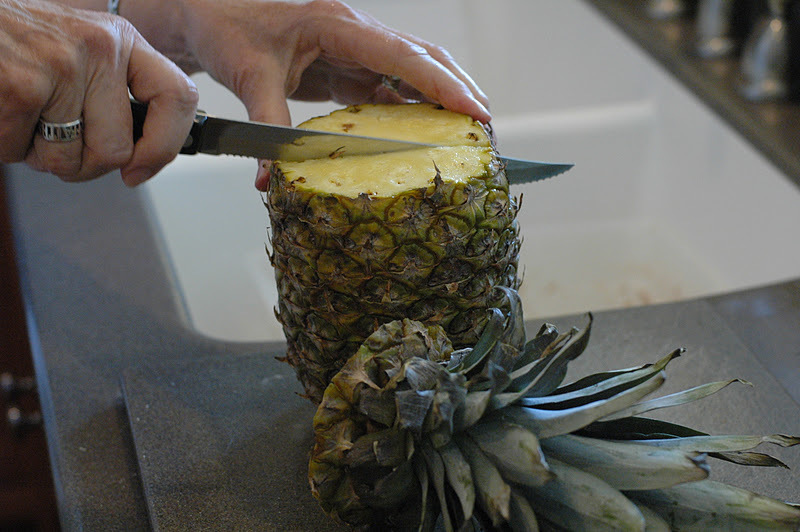 For chopping, pureeing and slicing, it is fast and powerful. Happy Shopping and Wish List Making! this list is AWESOME! i have already added the knives to my list thanks to this post. This is such a great resource, Julie! I even “pinned” it for Pinterest. You've just helped me make my Christmas list – so many times when I'm cooking or following one of your recipes, I remember – oh, that's what I wanted for my birthday or Christmas! Now it's all in one place – and since Rich uses your blog as much as I do for cooking, I know he won't lose my wish list!! YAY! !